You want to install Windows 7? No problem. Does your computer meet minimum specs? Do you want to go 32-bit or 64-bit? And what about Boot Camp? If these are your questions, read on. You've got to walk before you can fly, friends. Otherwise, you'll have to use Bittorrent. You get a product key when you sign up to download the beta, but if you've somehow got the beta bits but no product key, go here. They'll set you straight. Either burn the Windows 7 image file to a DVD, or put the image file on a 4GB+ USB drive and use a mounting program to load it. If you want to keep your current OS and programs intact, check out how to set up a dual-booting installation of Windows 7. You have a few options. The simplest is upgrading from your current Windows OS, but that can only be done from Vista. The other two options are a clean install (on a regular machine or on a netbook) and a Boot Camp install on the Mac. This is by far the easiest way to go that will preserve all of your programs. Just create your Windows 7 DVD or flash drive and open the installer on your desktop like any other program. Windows 7 will take over from there. A clean install is necessary if you are running XP, but it's also great for Vista users who want to start from scratch or would like the peace of mind of dual booting with another OS. To start from scratch, format your drive as you normally would and when you reboot, use a DVD with the Windows 7 installer image burned on it. That or boot from the DVD and follow the Custom options for a clean installation. If you'd like to dual boot, you'll need to set up a partition first. Lifehacker has a great guide for that. Just make sure the partition is at least 16GB. With a new partition in place, most users will be able to reboot their system with the Windows 7 DVD in the drive and install the OS to said partition. But if you activate the partition and restart before the OS is installed, you could be in for a hell of a long night of troubleshooting. Netbooks handle Windows 7 surprisingly well. Just keep in mind a few points. Storage is a premium on most of these systems, so many will not be eligible based upon that criteria (you need 16GB free). And Aero is not happening since these systems lack the video memory. But there's a complicated workaround to activate Aero if you enjoy the torture of a laggy machine. If you own a Mac, you're looking at a Boot Camp installation of 7. Both 32-bit and 64-bit versions can work, but older Macs are best sticking to the 32-bit version. Boot Camp 2.1 supports the 64-bit installation in most recent Pro-branded systems. Have your Windows 7 DVD (or flash drive with a mounting program) ready, and open up Boot Camp. You'll need to make a new partition that's at least 10GB in size (we'd recommend more, since PCs require at least 16GB). Follow the prompts, and Windows 7 will install. One catch to keep in mind, however, is that you may need an OS X DVD to load necessary drivers into Windows 7 after installation is complete. It'll guide you from there. Make sure that Search is including the folders you want...and only the folders you want. Start -> Search Programs and Files -> Type "index" -> Select "Change Search Options..."
Oh, you know you've always wanted to. 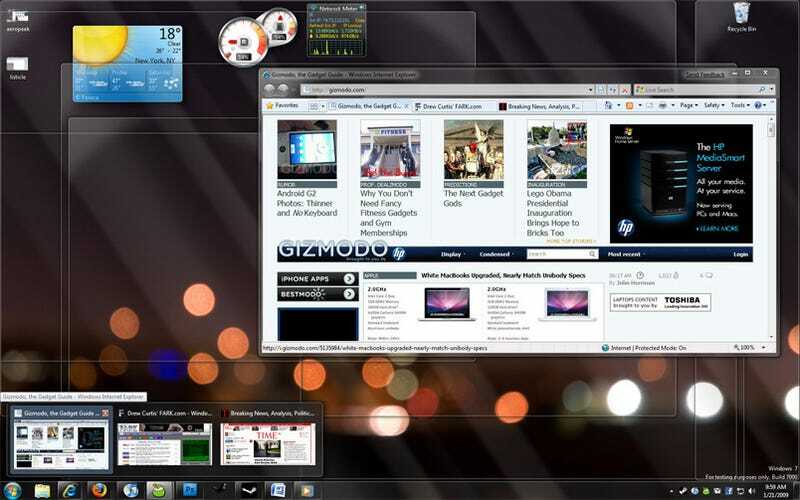 Now that you have Windows 7, hook up a second monitor in just two steps. Hit Win+P and choose an option. Done!